Bacteria is everywhere and while most microorganisms do not have much impact on our daily lives, some types can cause disease. Our pets are exposed to bacteria daily and most of the time their immune system is able to fight it off without showing any signs of sickness. Bacterial disease occurs when a dog’s immune system is weakened and the bacteria is able to replicate and spread in the dog’s body. The source of bacteria is usually contaminated water, dairy, feces or undercooked meat. Bacterial infections are common in dogs that come from rescue situations or spend a lot of time in boarding kennels where many dogs are housed in the same area. Puppies and geriatric dogs are much more at risk of becoming sick because their immune systems are not as strong as adult dogs in their prime. Dogs who are sick with a bacterial infection usually have digestive upset (diarrhea or vomiting), a fever and are lethargic or cranky since they do not feel well. Dogs can also occasionally be carriers of bacteria, meaning you can catch the germs from them, even if they are not showing symptoms of being sick themselves. Cleanliness practices when handling dog food (particularly raw meats) and picking up stool are key to keeping bacteria from spreading. 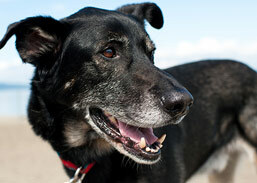 If you think your dog may have a bacterial infection you should call your veterinarian. Vets typically treat bacterial infections with antibiotic drugs and in severe cases additional support such as fluids for dehydrated pets may be needed. Investigation of a microcystis aeruginosa cyanobacterial freshwater harmful algal bloom associated with acute microcystin toxicosis in a dog. Dogs are highly susceptible to H5N1 avian influenza virus. Canine distemper virus persistence in demyelinating encephalitis by swift intracellular cell-to-cell spread in astrocytes is controlled by the viral attachment protein. Prescribing practices of primary-care veterinary practitioners in dogs diagnosed with bacterial pyoderma. Draft genome assembly of Bordetella bronchiseptica ATCC 10580, a historical canine clinical isolate. Though not reservoirs, dogs might transmit leptospira in New Caledonia. A new tetravalent canine leptospirosis vaccine provides at least 12 months immunity against infection.